Virtual reality experience offers immersive walk-through of recycling systems at Latin America’s largest waste industry expo. CP Group, the San Diego-based recycling solutions provider and equipment manufacturer, unveiled their Virtual MRF over a year ago. Now for the first time, it will be on display internationally at Residuos Expo 2018 in Guadalajara, Jalisco Mexico. 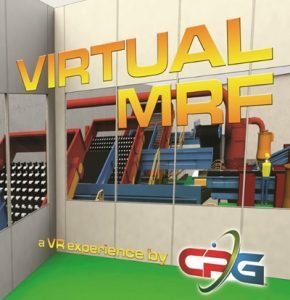 The Virtual MRF is a virtual reality simulation that uses two hand held controls and a virtual reality headset. The simulation allows users to navigate through a life-size computer-generated model of a material recovery facility (MRF) in real time. Residuos Expo, Latin America’s largest waste industry conference, is occurring concurrently with Expo Plasticos, with a combined expected attendance of 18,000 industry professionals. The show runs from November 7-9. Vargas and other members of the CP Group team will be running Virtual MRF demonstrations throughout Residuos Expo at booth #2112.